Well September has vanished in a blur of moving house and location as well as starting a new job. Tin and Thyme has been sadly neglected. However today is the first of a new month and time to get serious again. It’s also the date for the We Should Cocoa round-up and new linky. Here are 13 late summer chocolate recipes to inspire and delight. If you’d like to join in with next month’s #WeShouldCocoa, scroll down to the bottom of the post and you’ll find the October link-up. If you haven’t joined in before or need a reminder, you can find the guidelines on the We Should Cocoa page. Jenny over at Mummy Mishaps kicks these 13 late summer chocolate recipes off with these pick up chocolate brownies. I’m not sure it’s possible to get more chocolate into a brownie, so it double ticks all of the #WeShouldCocoa boxes. There’s only one thing better than a box of chocolates and that’s a box of chocolates inside a cake. You’ll find this beautifully executed Box of Chocolates Cake over at Only Crumbs Remain. And the chocolates and jam are homemade too. If you ever need an elegant dinner party dessert, these three layered chocolate jellies from Searching for Spice might be just the thing. They’re vegetarian friendly so I’d be able to tuck in too – hint hint Corina. If you like peanut butter then these Snickers cupcakes from Charlotte’s Lively Kitchen are for you. Chocolate cupcakes, caramel sauce and peanut buttercream – wow! This American Midwest chocolate cream pie takes me straight back to children’s book’s I used to read. I always wondered what they were and now I know. Head over to Carline Makes for the recipe. This tower of magnificence is a Nutella cake from The Baking Explorer. I get the feeling she’s a big fan of this particular spread. Have you ever tried a mayonnaise chocolate cake? It’s not as strange as you might think. Johanna over at Green Gourmet Giraffe has made this vegan version and it sounds gorgeous. If you’ve never paired coffee and pears, you may want to try this mocha pear upside down cake from the Gluten Free Alchemist. It may seem unusual, but it sounds delicious. It’s gluten-free too of course. I’m not sure why, but for some reason scones speak autumn to me. Right on cue comes Lucy of Baking Queen fame with these autumnal pumpkin chocolate chip scones. My contribution to these 13 late summer chocolate recipes are these rather luscious whisky truffles with dark chocolate and fresh cream. Following on from the Great British Bake Off’s Caramel Week, I would have been surprised not to see at least one Millionaires Shortbread recipe here. I’m not disappointed and this hazelnut millionaire’s shortbread with rum caramel from Recipes Made Easy is up there with the best of them. In fact we have two lots. These smart salted peanuts & peanut butter millionaire’s shortbread from Jo’s Kitchen Larder sound equally good. Now I’m stuck as to which one to try first. 13 Late Summer Chocolate Recipes. PIN IT. I am in chocolate heaven! That chocolate box is fun. That chocolate box is awfully clever. I don’t think I could ever pull anything like that off. I will have one of each please – all look wonderfully decadent! Glad you are still keeping in with WSC despite your busy times as I love seeing all the great chocolate creations – not sure where to start here – scones, cakes, and slices all do it for me! Yes, I’m up for trying everything – but then I usually am 😉 WSC is about the only surety in my blogging life at the moment. Thanks for hanging on in there with it. It turned 7 years old last month, but I forgot in all the excitement, so didn’t mention it. You’ve moved?! How exciting! I saw in a comment you made that you weren’t in Cornwall, but thought you must be on holiday….. Such a lovely round up and those pumpkin and chocolate chip scones are especially calling me now! Perfect for this time of year. Those scones look amazing Corina, they are calling to me too. I was rather impressed with your jellies and now itching to give them a go. All of these desserts look so delicious and my daughters are HUGE fans of chocolate… so I can use these goodies to bribe them for good grades. Thanks Jo. It’s only half a move really as CT and most of my stuff is still down in Cornwall. I’m hoping it won’t be too long until we’re all reunited though. These sound great. I love chocolate and am looking for some new recipes to try out with my child. 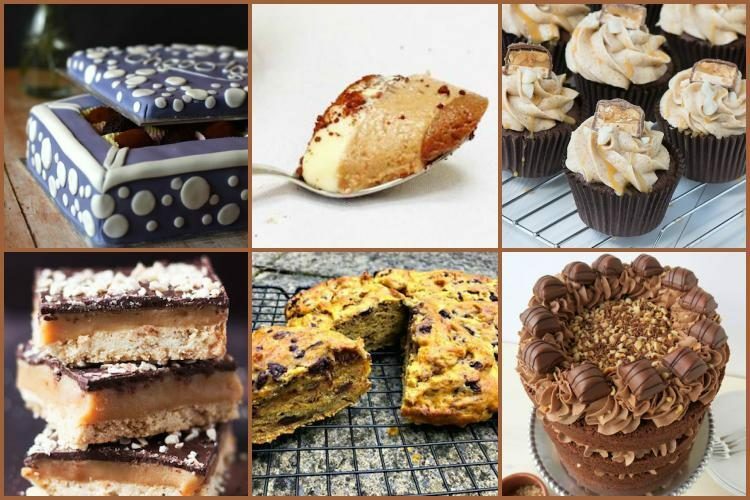 If you’re ever in need of chocolate recipes I have a #WeShouldCocoa archive going back eight years with hundreds and hundreds of fabulous chocolate recipes to choose from. oooh these all look incredible – some real chocolate dedication going on! And that Nutella cake from The Baking Explorer – just incredible!! I’m always amazed at just how inventive everyone is. Delicious roundup, I really want to make millionaires shortbread now I’ve seen those two. So gorgeous!